Two days have passed since the general elections, and Meretz Chairman Chaim Oron still finds it hard to fathom the results. Deemed one of the closes political campaigns of recent years, Tuesday's elections gave Kadima 28 mandates, the Likud 27 and indicated a substantial overall rise in the Right's political power. 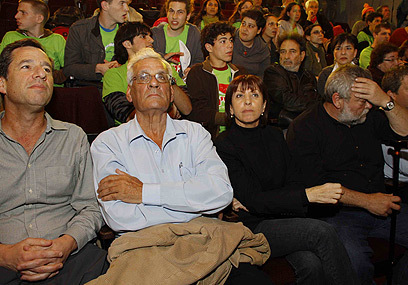 The Left's Labor won only 13 mandates and Meretz experienced its worst campaign to date, winning only three mandates. The fiasco proved greater, when after 99% of the votes were tallied, the party realized that long-time faction chairwoman Knesset Member Zahava Gal-On was left out of the Knesset. The last 48 hours have seen Oron be the target of cataclysmic criticism, but he is far from giving up or giving in. The first order of business, he said, is rehabilitating the party's status: "We are currently taking apart all of the campaign headquarters and returning to our old offices. We have our first post-elections meeting today and we will be doing some serious self-examination." Oron cannot pinpoint the reason for the party's downfall: "We will be looking into things, holding a series of session and we'll try to get to the bottom of things. The immediate answer to what happened is that the last two days before the elections saw a very successful – false - campaign by Kadima. "The alleged 'showdown' between (Kadima Chairwoman Tzipi) Livni and (Likud Chairman Benjamin) Netanyahu drew away a lot of our potential voters, and it costs us a mandate or two, some say maybe more." Oron has also been criticized for aliening with the Left's New Movement, but he has no regrets: "In the early stages (of the campaign) the alignment seemed to show we were gaining strength in the polls, and the public seemed more aware of the party. Some called it a good idea, other even called in genius, and today some say it was the reason we failed. I don’t think it was the main reason we failed." Oron also disagrees with the allegations suggesting that Meretz's support for the Israeli offensive in Gaza in its early stages hindered its way to the Knesset. "Would we have fared better had we opposed it? I think we lost more votes because we didn’t support it all the way through. We said what we were thinking – we saw the offensive as justified at first and then we so no reason to continue it. Believe me – we lost more votes in the Gaza vicinity communities because we didn’t support the operation through." The party, he stressed, may not support Livni as the better candidate to form the coalition was not guaranteed: "If she teams with (Yisrael Beiteinu Chairman Avigdor) Lieberman we will not recommend her; and since we know there is a substantial chance a Netanyahu-led government in underway, we may reserve our right not to recommend anyone." According to the Israeli electoral system, the president – who is officially supposed to assign the winning candidate with forming the government – is bound to task the candidate most likely to form a coalition with the job, which in this case does not necessarily means the de facto winner. Party veterans have already begun demanding Nitzan Horowitz, the New Movement delegate secured the number-three slot on Meretz's Knesset roster, forfeit his place in favor of Gal-On. Some, including several women's organizations, have called on Oron to forfeit his own seat in favor of the faction chairwoman, but he will not hear of it. "These are the same women's groups who told the voting public to choose Livni. I didn’t hear any of them say, 'Let's vote for party that ensures women's representation and get Zahava elected.' With all due respect, they cannot expect to have a say on any person's position on the roster. The list was decided on in advance and those are the people who will be in the Knesset. "I still hope that by Thursday night (when the remainder of the votes is tallied) we will have our fourth mandate and Gal-On will get into the Knesset," he said. The thought of stepping down, he added, never crossed his mind. "It is my responsibility to take care of what is going on in the party right now. We have to get back on our feet, pay our debts and see where we go from here." When asked if he ever saw Meretz drop to three Knesset seats, Oron said no. "Five mandates would have been an undesired result, but anything below that is a clear failure. We have been defeated. I know the tradition in Israel is for the responsible person to step down, but I intend to stay and help rebuild the party." See all talkbacks "Meretz chief: Women's groups support of Livni harmed us "